If certain results were seen as forgone conclusions at the recent British Championships, then the women’s backstroke events would surely have fallen into that category. Barnet Copthall’s Sarah Price had been top of the domestic game for close to three years, picking up a long list of titles and records along the way and few could see her relinquishing that position lightly. 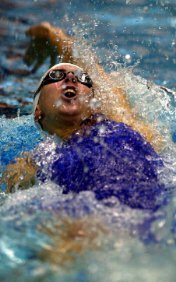 What everyone had reckoned without, however, was the dramatic reemergence of Katy Sexton to top form as the Portsmouth swimmer dished out Price’s first defeats by a domestic swimmer for some considerable time. Not only that but her time for the 100m and 200m backstroke were both British and Commonwealth records and place her near the very top of the world rankings. Keen to find out what had prompted such remarkable performances pullbuoy caught up with Katy at the GB squad orientation camp. How happy were you with your swims at the trials? I was really happy as I haven’t been swimming that much for the previous 18 months because of an injury in my shoulder and for 6 months of that I was only doing kick so I wasn’t sure what I was really capable of having done some proper training, so to get in and swim two Commonwealth records – I’m pretty pleased with that! It is, I couldn’t believe that I’d taken as much off my best as I had and it was great to get rid of my PB, which has been hanging around since 2000. You said after the event that you’ve been doing more weights work – has that made a difference? I had a whole year out of strength work, because I couldn’t move my arm above my shoulder, so I’ve just been working it back in to my programme over the past 6 months and building it up . I’ve been doing some free weights and circuits and medicine ball work and it seems to have paid off. Is a sub 60s 100 backstroke a real goal now? Definitely – now that I’ve swum that fast. I knew I could swim sixty point, but 60.4 is closer to 59 than 61, so sub minute is definitely within my reach now. In the Commonwealth Games 200m final, you came back very fast on the last 50. You seemed to come back just as fast here but with a much faster first 150? This time round I have the speed to get out whilst still being able to bring it back. I’ve been working on my speed as I know I have the strength at the back end to bring it home. We’ve done a few back end sets, but I know that’s one of my strengths so we’ve been working more on the front end speed of my race and just getting out fast. I want to get out in front and hang on! How good did it feel to beat Sarah Price? Yeah, for the past three years she’s kind of taken it away on her own, so maybe it’ll be good for her to have a bit of competition! We’ll probably drag each other along and I expect the records will pass back and forwards a few time over the next few years. The competition will definitely do us both good. What do you make of Stephanie Proud? She’s a good young swimmer with great potential, we should all keep an eye on her for the future and keep looking over our shoulders! Definitely, I think that having an injury just made me think hard about my swimming and gave me the determination to work hard and keep going. Looking back do you think all that kick has actually benefited your swimming? Are you conscious of the injury when you’re swimming? Not really, but it is an area of weakness at the moment. Last week did over exert it a little bit and it’s a bit sore, so I’m being a bit more careful than usual this week, but I haven’t changed my stroke really. What do you make of Nathalie Coughlin? She’s a phenomenal swimmer – I think now my actual swimming is probably just as fast as hers, but her starts, turns and underwater work are all better than mine, so that’s an area I’ve now got to focus on and improve if I’m going to compete with her. I hope so! and hopefully it will be one of us Brits! We’re working together this week filming our underwater work and trying to improve it and just generally helping each other out. It’s always good to work with each other as there’s a bit of competition and with a different coach you get some new ideas. How’s the camp been this year? It’s been good. It’s always hard getting back into the swing of things as I’m on a bit of an anti-climax after swimming so fast at the trials it’s just part of the recovery really. We;’re doing a lots of reaction work, and we’ve been doing starts as a whole squad before we get in together and really practices so it’s made life a bit easier. You went out to Australia to the offshore training centre (at The Southport School in Queensland) – how was that? It’s really good – they’ve got a 12 lane 50m pool at a school and we don’t even have one in this country! And it’s outdoors which is really nice. There were 7 of us girls out there with Chris Nesbit and it was a good trip apart from the 25 hour delayed flight, then I got food poisoning and when we arrived it was raining! Apart from that it was a really good camp – after that start it couldn’t get any worse! Hopefully we’ll go back next January, to keep out of the winter here! Finally, what’s your aim for Barcelona? Coming off the trials, my swims have put me in the top 2 in the world, so a medal would be good!